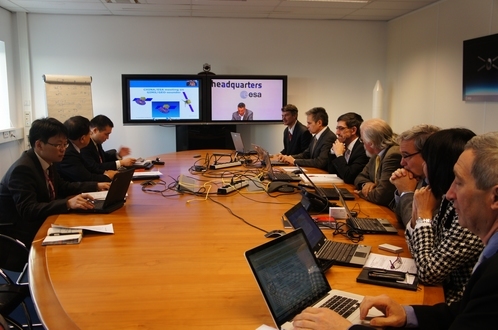 On Jan 14th, 2013, a delegation team headed by Professor WU Ji, Director General of National Space Science Center (NSSC) paid a visit to the European Space Agency and European Space Technology in Noordwijk, Netherlands. F. Ongaro, Director of ESA Technical Directorate welcomed the delegation and expressed his wish for further cooperation in Geo-sounder. In the following section, WU Ji introduced NSSC briefly and touched upon the recent progress of Geo-sounder. Both parties discussed in detail the format of further cooperation and the cooperative schedule as well. The delegation also visited ESA Antenna Testing facilities, Omnisys Instruments Company and RUAG Company in Sweden where the delegation communicate with the industry on the technical aspects.